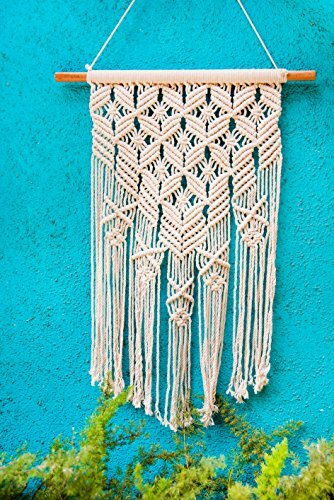 Boho style macrame wall hanging is a gorgeous 100% cotton tapestry and is absolutely perfect accent piece for your home, office, and apartment or dorm room. Finely woven in a handcrafted style from artistically twisted cotton cords this full of decor wall hanging reflects the finest craftsmanship in the traditions of both Native American and ancient European artwork. Our traditional textile wall hangings give any living space a vintage and rustic feel while imbuing the room with a sense of history, culture, and design. Perfect for outdoor themed rooms, cabins, or sunrooms each wall hanging recalls the finest arts and crafts traditions stretching back countless generations. Clean modern lines merge with old world design to give your room a cultural and earthy touch which pairs with countless styles of furniture and colors. Wall tapestries hang handsomely above your fireplace, headboard, or entertainment center accenting your existing artwork and interior decor. Timeless handmade style cording and elegant fringe draping creates a beautiful, slender, wall banner which can easily be hung and displayed on drywall, stone, brick, or wood surfaces. Hang your tapestry using single nail or tack to turn any space into a artistic gallery. Gorgeous cream colored cottons and patterned fringe bring a dash of light to any room. Hang the tapestry in small rooms or cramped offices to bring a soft reflection and subtle texture to otherwise dull spaces. All items are handmade; there may be slight variations in size and colour in relation to the item in the images. Makes the perfect statement accent piece above your bed. Our exclusive handcrafted hippie bohemia macrame wall hangings are inspired by tribal objects, ethnic art, aztec decor and boho decor. Unique, modern, classy and beautiful geometric design, after hours of professional knotting, meticulously handcrafted weaving, using natural materials giving a minimalist feel and creating a relaxed feel in the room. It's big and durable, suitable for indoor purpose. Macrame 15.0" width X 28.0" length, wooden bamboo dowel 17" long.